"Vaccines are an important tool in the fight against Ebola. This is why it has been a priority to move them rapidly into place to begin protecting our health workers and the affected population," said Dr Oly Ilunga, Minister of Health of the Democratic Republic of the Congo. 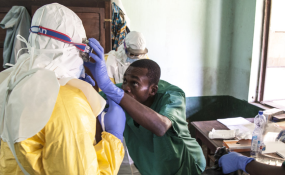 "The Democratic Republic of the Congo has once again demonstrated strong leadership in its early response to this outbreak," said Dr Tedros Adhanom Ghebreyesus, Director-General of the World Health Organization (WHO). "Ebola is aggressive. We must respond more aggressively. Beginning the vaccination so quickly is a key early step."